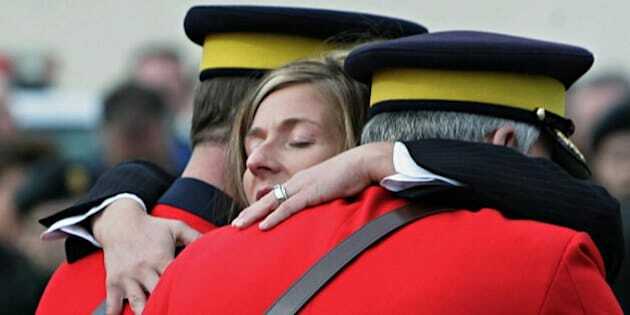 Ten years after four Mounties were gunned down in the line of duty in Mayerthorpe, Alta., residents will gather to remember the victims with a candlelight vigil. Leo Johnston, Anthony Gordon, Brock Myrol and Peter Schiemann were killed March 3, 2005 by James Roszko after they were called to execute a property seizure on Roszko's farm. They were shot down with high-powered bullets from a semi-automatic assault rifle. Roszko then turned the gun on himself, but not before being wounded by an officer. It is the worst multiple-officer killing in modern Canadian history, and to this day no single event has taken the lives of more officers. On Tuesday at 6:30 p.m. Albertans are invited to gather at the Fallen Four Memorial Park to honour their sacrifice. Margaret Thibault with the Fallen Four Memorial Society told Global News the park was created in memory of the officers, to balance out the negative with something positive. "We ask that when you blow out your candle, you transfer the flame of love, faith, memory, courage and hope to your heart, mind and soul to carry with you at all times," Thibault told The Edmonton Sun. As well, an annual memorial marathon to honour the officers will go ahead this year on June 7 in Mayerthorpe. The Fallen Four Memorial Society says this year's run will be marked by an f-18 flyover and a weekend airshow.